Obesity results in changes in brown adipose tissue (BAT) morphology, leading to fat deposition, inflammation, and alterations in sympathetic nerve activity. Bardoxolone methyl (BARD) has been extensively studied for the treatment of chronic diseases. We present for the first time the effects of oral BARD treatment on BAT morphology and associated changes in the brainstem. 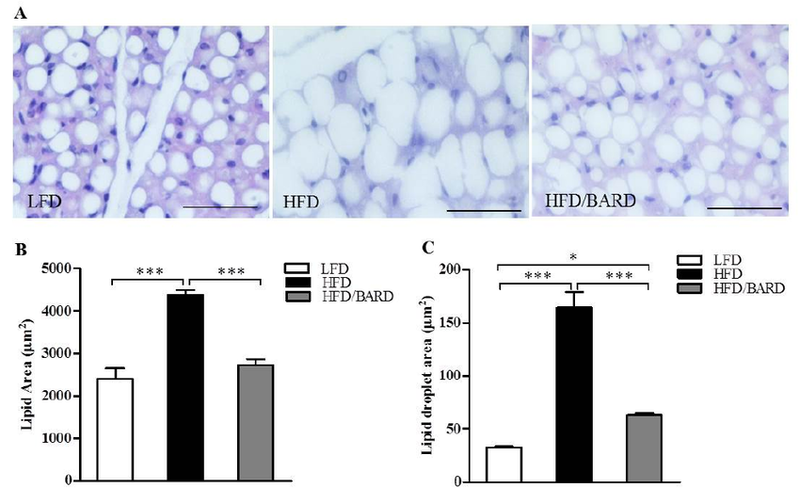 Three groups (n = 7) of C57BL/6J mice were fed either a high-fat diet (HFD), a high-fat diet supplemented with BARD (HFD/BARD), or a low-fat diet (LFD) for 21 weeks. BARD was administered daily in drinking water. Interscapular BAT, and ventrolateral medulla (VLM) and dorsal vagal complex (DVC) in the brainstem, were collected for analysis by histology, immunohistochemistry and Western blot. BARD prevented fat deposition in BAT, demonstrated by the decreased accumulation of lipid droplets. When administered BARD, HFD mice had lower numbers of F4/80 and CD11c macrophages in the BAT with an increased proportion of CD206 macrophages, suggesting an anti-inflammatory effect. BARD increased phosphorylation of tyrosine hydroxylase in BAT and VLM. In the VLM, BARD increased energy expenditure proteins, including beta 3-adrenergic receptor (β3-AR) and peroxisome proliferator-activated receptor gamma coactivator 1-alpha (PGC-1α). Overall, oral BARD prevented fat deposition and inflammation in BAT, and stimulated sympathetic nerve activity.